In order that a picnic should prove the unqualified success it should be, more than a fine day and pleasant company – both highly important items – are required. Forethought must be exercised by the hostess in regard to the countless small details which go to make up the comfort of her guests. Leave nothing to chance. If a river picnic be in question, and the party be going down from town, write a couple of days beforehand to the traffic manager, asking to have a carriage reserved for your party by whichever train you propose to travel, not forgetting to mention the class. Write also to engage the necessary boat or boats – weather permitting – from a reliable waterman, who will have soda-water and stone ginger-beer in readiness to stow aboard, if asked to do so, besides good-naturedly providing bottles of drinking water for making tea. It is hardly too much to say that at least half the success of a picnic depends upon the providing of daintily packed and appetising looking fare, be it as elaborate or as simple as you please; and the invention of cardboard plates and dishes has greatly simplified picnicking, for they cost only sixpence a dozen and are strong enough to allow of cold chicken and salad or cold meat pie being partaken of upon them. The weight is practically nothing, and they take up very little space to pack. Drinks are a very important matter. Stone ginger-beer is always popular, and, if wine is to be taken, hock and claret are best, with plenty of soda-water to accompany them. Few people know that tumblers are to be had for a penny each at any penny bazaar, and are quite good enough for picnic purposes. Choose the shape which will half-fit inside one another, and allow a couple of extra glasses in case of accidents. A moonlight picnic given in the height of summer on a night on which a full moon is due as soon as the dusk falls is sure of success, and one’s menkind, who have been working in the City all day, as a rule welcome the idea of a few hours spent out in the open air with much enthusiasm. Such a picnic party might meet at the railway station at half-past six or seven, and on arrival at their destination should take possession of a field where the grass has already been cut, spreading their tablecloth on sloping ground, so that if heat mists rise along the hedges of low-lying fields they may be high above them. Each member of the party should be provided by the hostess with a Chinese lantern and a nightlight or candle, and these can be hung to the branches if the moon delay her rising or be overcast, and will also serve to light the picnickers on their homeward way, making a highly picturesque effect as they wind through the fields and by-paths. Subscription picnics, if well organised, will prove an immense success. An honorary secretary must be appointed, who will draw up a list of necessary provisions, and then write postcards to each of the party giving directions as to what to bring. 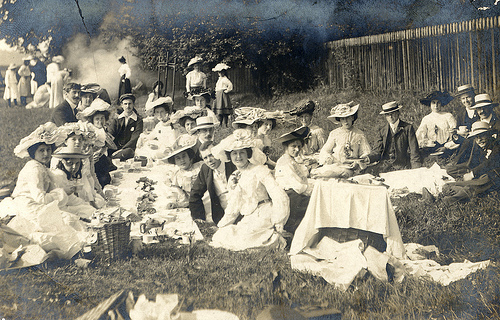 In a party of ten, for instance, for a moonlight supper picnic, two might bring fruit, two a supply of daintily cut ham sandwiches, one a dozen hard-boiled eggs and a bottle of cream, one salad and paper picnic plates; two might share a big cake between them, and two provide drinks, the honorary secretary making herself responsible for a table-cloth and a few knives and spoons, besides her share of the provisions, for, with such fare as has been described, knives and forks would not be needed, while the fact of the provisions being divided up into so many separate parcels makes it easy to convey them to the picnic ground without hiring outside help. Impromptu picnic dances run on the same lines in summer-time by a party of intimate friends collected together at any little seaside or riverside resort, where a suitable room or boat-house, or even a barn with a polished floor, can be hired for the night, are delightful. 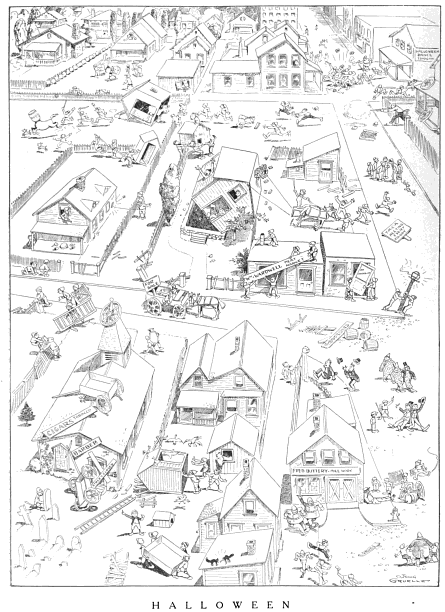 Each picnicker subscribes a trifle towards the music and the room hire, and each one arrives “on the night” armed with a mysterious parcel or packet, which, when unpacked at supper-time, reveals itself to be a basket of fruit, sandwiches, or a cake, or, perchance, a bottle of claret or hock, the provisions being partaken of in impromptu fashion on the stairs or in the garden. The bicycle had become commonplace and affordable, but the motorcar not yet ubiquitous, so it is a given that roller skating–essentially wheels on your feet–became an overnight sensation in 1905. Granted, there was a brief craze for roller skates when they were first massed produced in 1880s America, but the introduction of the bicycle no doubt stole its thunder. By the following year, roller skating had spread like wildfire across the country, and many newspapers reported its popularity was so great, young people neglected their other forms of amusement! Roller skating soon reached Europe under the aegis of the American Roller Rink Company, whose managing director, C. P. Crawford, traveled as far as St. Petersburg to lease large plots of land on which to erect American-style roller skating rinks. Soon, in London, Paris, Vienna and Berlin, skating was “regarded quite as essential an amusement as theatres and music halls, and the rinks are never closed except in midsummer.” The Parisians loved the fad, hosting fancy dress balls on roller skates, divising new skating tricks, and even adapting popular dances for roller skating. A new costume for roller skating was de riguer, and lady skaters were advised to wear tailored suit and matching shirtwaist for the morning, princess gowns for the afternoon and evening, and Dutch dress (princess style with low neck and shoulder straps) over a chiffon guimpe, or corduroy princess-style frock for the night–all in brilliant colors. 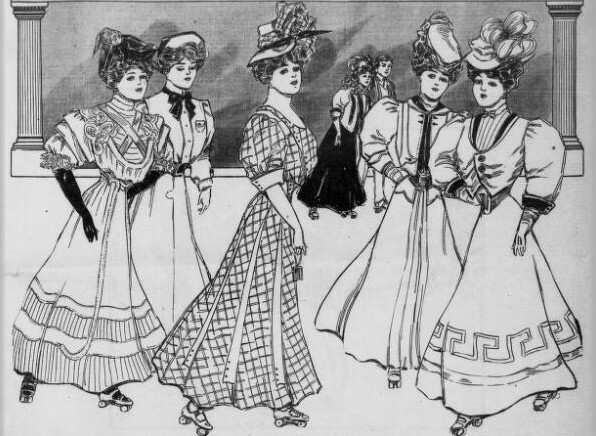 Shockingly, young Parisian ladies went without corsets during their morning skating sessions, and Americans fashion writers cautiously championed this. As with all fads, there were detractors: concerned parents and religious leaders denounced the absorbing craze, and owners of ice skating rinks (and avid ice skaters) sniffed at roller skating as a lesser sibling to ice skating. Hyperbole from newspapers whipped up agitators against the fad, proclaiming how dangerous the sport was and citing the alleged hundreds of people injured or sacrificed by roller skating every week. However, as with all fads, the madness for roller skating died a natural death by 1912, probably because young people realized you couldn’t bunny hug or tango on skates! Halloween Paradoxes. – THE EVENING before All Saints’ Day, formerly called All Hallows Eve, was originally given to religious observance. Modern usage now spells it Halloween, and it is now devoted mainly to mischief. In the larger cities that enjoy adequate police protection the impulses of male youth on Halloween are held in check, although mischievous purpose is not wholly defeated. In smaller towns the evening brings terror to staid citizens. If they are not routed out of doors by fires in their domiciles or by other fearsome haps, they awake in the morning of All Saints’ Day to wonder why the saints had not during the night prevailed over deviltry. Boys and young men who see fun in such things tip over small barns, dress up cows in unseemly costumes, put barrels over the heads of mild-mannered horses and turn them loose, remove buildings from foundations to unlikely spots of the landscape, change “signs” on buildings so that the public is confused, scare hens and other fowl from their roosts and make them wanderers, release pigs from cozy quarters, remove fences and obliterate property lines, and sometimes even decorate small village churches with articles that bear no relation to religion or even to common sense. These are but a few of the pranks played on this evening. In fact, the worst has not been told of boys’ “goings on.” It sometimes happens that youth in this employment is punished by outraged owners of property carelessly handled, or apprehended by constables who on this one night are not permitted to rest. But precedent and the effervescent spirit of boyhood cannot be wholly overcome, and Halloween will continue to be a period of chaos in places where local self-government does not include the young in its beneficent scheme. While Halloween affords boys an opportunity for fun that fits their inspiration to turn things topsy-turvy, it is an occasion to which girls look forward with superstitious awe and hope. Love and matrimony are never absent, it would seem, from the minds of maids of a certain age, and this night affords them opportunity to test the various sorts of wizardry related to sentiment and Halloween. Thus, if a girl peels an apple without breaking the peeling, throws it over her shoulder, and it takes as it falls the initial of some young man, she is reasonably assured by this means that he will marry her. Or if she holds a lighted candle while standing before a mirror in an otherwise dark room, and looking over her shoulder sees the image of the youth of her choice, she is made happy in expectation. Or if she and her girl companions place a thimble and a ring in a wad of dough, bake a cake of it, and cut it carefully when done, it is to them as true as gospel that the maiden who gets the ring will be married shortly, while she who gets the thimble will die an old maid. Or if one writes the names of her young men acquaintances on slips of paper, puts them under her pillow, and dreams of one of them, that one she is fated to wed. These are but a few of the love tests of Halloween. What a happy period is youth, after all!